This weekend was a busy one at the Deadend Magazine headquarters. We spent the last week or so remodeling the Deadend Magazine store. 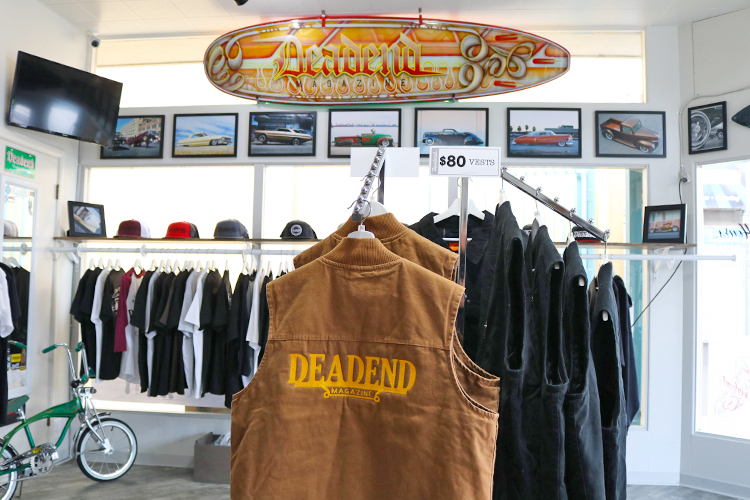 On Saturday we celebrated the remodel with a release of new Deadend Magazine merchandise. Thanks to everyone who brought out their cars and spent some bucks at the store. Tino brought out his 'Pan Dulce' up from Santa Barbara, CA. Beautiful Buick parked front & center. A couple of Chevy customs. Would be nice if the Deadend Magazine store looked like this everyday. Here are a few shots of the new & improved Deadend Magazine store. If you get a chance stop by 16 Midtown Ln. Salinas, CA. New hours are Tuesday - Friday 11am - 7pm, Saturday 10am - 5pm, Closed Sunday & Monday. A new skateboard at the store by Phil at Syrarium Studios. We have a few new snapback designs available. We have a few Deadend Jackets available at the store. We still have a few Deadend Magazine skate decks available at the store. Last week we forgot to post up some of the photos we took of Lupita Ucali and Ann who were visiting Southern California from Japan.